Hi there. I’m from a house church in Winnipeg, Manitoba, Canada. We are posting some sermons on an upcoming web edition, and would like to use this picture for our sermon on the healing of Naaman. Where did you get this picture from? We would like to credit the source if possible. That site doesn’t have a source credited, though. Naaman the Syrian bathes in the waters of the Jordan River at the advice of the prophet Elisha and rids himself of his leprosy (2 Kings 5). 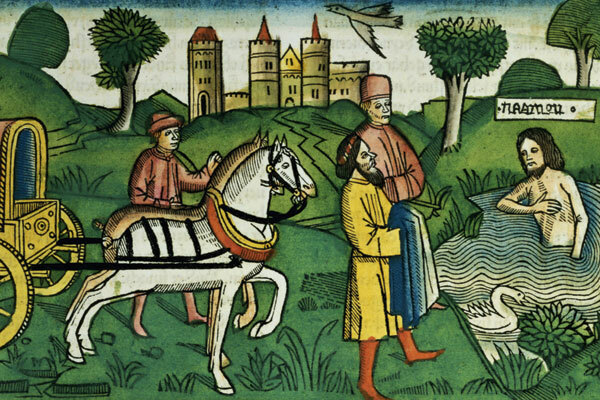 Woodcut from the Cologne Bible, 1478-80. Thanks a lot, that was helpful. I appreciate you taking the trouble to do the detective work on that. All the best in your endeavors.